We have lived in our house for six years this month and every month of every year I have hated the back of this bar area! It is sooo blah and sooo oak and sooo country looking. So, started researching what I wanted to do with it. First I tried to add the decorative wood corner pieces along with a decorative wood scrolly thing (real technical name, huh?) for the center. Did a cool paint treatment and really loved it, just threw some wood glue on and glued them up there. They lasted about six months. Every month or so another decorative piece would fall off until all I had left was one corner piece and the middle thing. I then tried a paper bag wallpaper treatment that really worked well and, of course, was real cheap. After applying the paper bag wallpaper I mixed some brown paint with water and antiqued it. Then, let that dry and antiqued it with a black glaze. Looked absolutely fantastic but as it started to dry the paper bags started lifting off the wall. 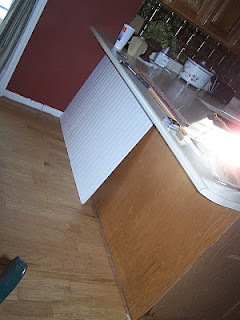 So, I finally ripped it all off and lived with a nasty looking counter. (This was all before I entered blogdom and have no pictures of it). Then after we had finished the beardboard in the bathroom I was looking at the pile of leftovers and realized that I had enough to finish off the back of the counter. This got me searching on the internet to look for ideas and inspiration because although I liked the beadboard idea, couldn't figure out how to finish it and marry it with the oak cabinets. Which, quite honestly, I would like to paint but hubby is not sold on the idea! My husband did cut the wainscoating for me. I decided to paint it black from inspiration I got from Thrifty Decor Chick. 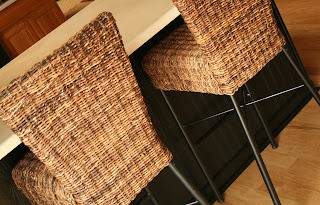 She did a great job of blending a black beadboard counter bar with her maple cabinets. After a simple (only about 16 coats of black paint....easy!) paint job, I applied liquid nails and some panel nails and slapped it up. That was super easy! Finished off the outside corner with the existing trim piece painted black. Purchased the cheap baseboard and quarter round, again painting it black. Mitered it and installed it. I think it turned it pretty nice. Actually, I love it! 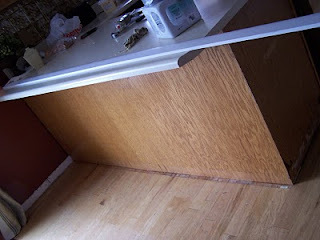 Now, to find a cheap solution for my 'blah' counter top! A great transformation, I really like it! Now that's a fab improvement. Looks great! Oh, YES, so so much better. I added that to mine when I redid my kitchen and love it! GREAT job! Great transformation! 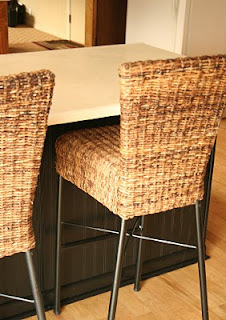 I really like the black beadboard and the bar stools. It looks great! It's amazing that something so simple can add a big change. Looks terrific! I have one of those ugly bar areas, too! 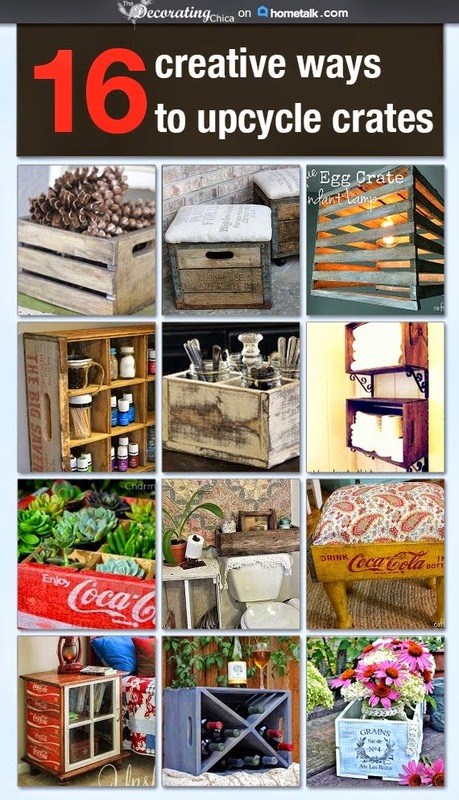 I loved Thrifty Decor Chic's makeover, but still wasn't sure I could do it...you've inspired me to think maybe I can! ; ) Great job! LOVE it! It turned out great. I want to do this to my island! great transformation! we just bought some beadboard to add to our kitchen, I hope it looks as nice as yours when it's done. 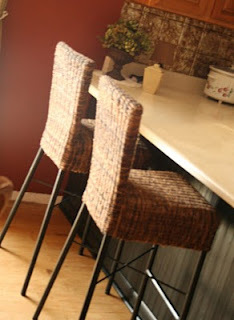 LOVE those stools too! very nice! I love it! I have been wanting to do this to mine for quite some time, but have never had the courage to do it for fear I'm going to ruin something! Big question for you...did you do the side of that cabinet or just the back? From where it turns from bead board back to your regular colored cabinets, does it look funny? That's been my big hold up. How do you transition that? That looks amazing!! Love the new look. I love beadboard and it looks great painted black! That sure was your answer, looks great!! Nice Job! I'm hoping to do the same thing to my island soon. I like how you painted it black. It gives it a more modern look. I really like how it turned out. A huge transformation. WOW! That makes such a difference. Looks great, nice job! Big improvement! And just keep working on your husband, and you'll get to paint those kitchen cabinets. That looks really good! And I love those stools! As far as the countertop, Rust-Oleum makes a Countertop paint that can be tinted to 16 different colors. I've never used it before, but I saw the advertisement for it in a magazine, and thought it might be a good solution. Also, you can pick up butcher block from Lumber Liquidators or Ikea for pretty cheap if you want to go a little farther than just paint. It looks wonderful. I just painted my countertops with the Rustoleum Paint and it worked beautifully. They survived their first dinner party too! I really recommend it! Love,love,love it! From the looks of it, my kitchen layout is exactly the same as yours. I have that same 'island' and it looks like the same wall color & cabinets. Love the backsplash and the beadboard - both are ideas I'm trying to convince my hubby to go for and I think your pics will help. And, like you I'm looking for a way to update my counters. Be sure to post something when you find a solution :0) Thanks for sharing!! LOVE it! It looks absolutely beautiful! That black was a perfect choice. It doesn't clash with your cabinets, but doesn't become bland and matchy either! I'm glad you found a more permanent solution after all that trial and error! I love me some bead board. It looks great! Wow! That turned out great! And I love that you painted the beadboard black. Perfect choice. Look great! PAINT your countertop! I swear it's so easy and so worth it. I spent $50, and now it looks like granite!! It won't fool people into thinking it's the real thing, but I had faux butcher block laminate from the 80s, and you can't get much worse than that! I love my countertops.. did it in the bathroom too. Let me know if you have any questions about it or want to see pics. So clever and creative and love that budget! It looks amazing. I'd swear it was slate! Great job! Thanks so much for sharing in the DIY Project.